Terrorism as a social movement played a big role in the last two decades. Since the attacks of September 11th, the western world has labeled Al-Qaeda as suicidal and irrational terrorists hating the western “way of life”. Is this really why Al-Qaeda emerged? If yes, then why? 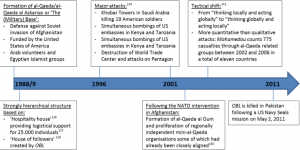 Since 1993 to the present, Al-Qaeda had gone through many stages over the past twenty years. These changes have affected its organizational mode and structure and shifted the organization into a new level. This paper is going to focus on the political and social changes Al-Qaeda has gone through that affected its organizational mode and structure. Applying social movement theories would give a better understanding and a full picture of Al-Qaeda’s development. It will explain in details the reasons behind Al-Qaeda’s emergence, what caused the change in the organizational mode leading to today’s structure and to what extent can social movement theory describe al-Qaeda’s development. To answer the research questions, three social movement theories would be discussed, which are, resource mobilization theory, political opportunity processes, and framing processes. Al-Qaeda emerged in Afghanistan in the late 1980s as volunteers joining the US-backed Afghan fighters to fight against the occupying Soviet Union. Osama Bin-Laden set up an organization to help the volunteers, which became known as Al-Qaeda, or “the base” in Arabic. He left Afghanistan in 1989, returning in 1996 to run military training camps for thousands of foreign Muslims. In 1998 he called for attacks on US soldiers and civilians. Bombs soon destroyed two US embassies in Africa. Understanding Al- Qaeda’s ideology is central to prevailing over their structure and the phenomenon of global terrorism. The international common image about Al-Qaeda’s ideology is that they hate the western way of life and that they want to implement Islamic Sharia Law to rule with it. This might not be necessarily the main objective of Al-Qaeda. Al-Qaeda’s ideology is profoundly internationalist, attempting to contextualize local conflicts as part of a broader global struggle against oppressive regimes. They are just like any other terrorist groups; seeking to achieve their political goals by spreading fear and terrorizing people. Al-Qaeda’s strategy flows logically from its ideology. To many, those within the terrorist network may appear irrational, motivated by hatred, have unrealistic goals, and willing to kill innocent men, women, and children to achieve their end. In reality, however, Al-Qaeda like other terrorist groups, acts in a largely rational manner in the sense that it weighs ends and means, consider alternatives approaches and costs and benefits (Beyond Al-Qaeda Book). In addition, for Al-Qaeda and the groups that share the same ideology, governments in the Middle East primarily exist because of U.S. support; their destruction thus is contingent on removing that support. Al-Qaeda has sought to achieve this objective by pressuring the United States to withdraw from the Middle East through the perpetration of increasingly costly terrorist acts. Ever since the 1998 bombings of U.S. embassies in East Africa, Al-Qaeda has continually altered and expanded its targets, making organizational modification that have resulted in significant changes in the way it conducts operations. The use of planes as suicide bombing in the September 11 attacks, and the small boat packed with explosive that devastated the USS cole are two of the best examples of Al-Qaeda innovation (160). Since the 1980s, Al-Qaeda has gone through different stages that witnessed a serious transformation in its structure and behaviors. The formation of Al-Qaeda started in 1988/9 as Al-Qaeda al Askariya or “The military Base” for the defense against Soviet invasion of Afghanistan that was funded by the United States. The base was including Arab volunteers and Egyptian Islamist groups. During that time, the structure of Al-Qaeda was strongly Hierarchical and based on Hospitality house, providing logistical support for 25,000 individuals and House of Followers created by Osama Bin Laden (137). Since 1996, Major attacks of Al-Qaeda started to took place starting from Khobar Towers in Saudi Arabia killing 19 American soldiers. This was followed by simultaneous bombings of US embassies in Kenya and Tanzania. In 2001, the tragic bombing of World Trade Center and attacks on Pentagon took place, following the NATO intervention in Afghanistan where the formation of Al-Qaeda al Oum and proliferation of regionally independent mini-Al-Qaeda organizations occurred, some of which has already been closely aligned in many Arab countries (140). Thereafter, Al-Qaeda had several tactical shifts from “thinking locally and acting globally” to “thinking globally and acting locally”. They focused on more quantitative than qualitative attacks: Mohamedou counts 775 casualties through Al-Qaeda related groups between 2002 and 2006 in a total of eleven countries (90). 2011 marked the killing of Osama Bin Laden by the Obama administration. Given the fact, the killing of Bin Laden has removed the movement’s ideological figure, these findings may be useful in anticipating future developments and the movement’s reaction to opportunity in Iraq and Afghanistan following the withdrawal of allied forces will increase Al-Qaeda presence in the region. Furthermore, Al-Qaeda is classified by the United Nation and by many, if not all countries and international organizations as a terrorist group. The entire world, including the United States, have declared a “war on terror” campaign, but it turns out that there is no universal agreement on what “terrorism” really is. The State Department of US said in a report on world terrorism in 2000 that, “No one definition of terrorism has gained universal acceptance” (State Department). The key elements to terrorism are obvious to many, violence, noncombatant targets, intention of spreading fear, and political aims. Finding a commonly accepted definition, however, has proven difficult. Are attacks on military personnel or political leader’s acts of terrorism? What about attacks on property? Must terrorism be physically violent, or is it enough to simply instill fear? After the September 11th attacks on New York and Washington, that was believed to be committed by Al-Qaeda, there is more pressure to agree on one particular definition. Leading governments like the US have used the word terrorism to describe the threat they are facing, ignoring completely, the threat they are making internationally. Richard Betts, director of the Institute of War and Peace Studies at Columbia University states, that many people believe there are cases where extreme actions are justified. For instance, the United States have bombed civilian targets in Afghanistan, Yemen, Somalia, and Iraq, but few would call it terrorism. The action is widely considered justified by the fact that the United States’ national security has been threatened and they had to fight it back. Therefore, everybody can find an exception to any abstract definition (90). It is believed that Dictatorships terrorize their own people; democracies do not; but they can engage in state sponsored terrorism in other countries. Declaring war and sending the military to fight other forces is not terrorism, nor is the use of violence to punish criminals who have been convicted of violent crimes, but many would argue that democracies are also capable of terrorism. Israel has for many years been characterized by critics, especially in the Middle East, United Nations Resolutions, and human rights organizations, as perpetrating terrorism against the Palestinians since 1967. Palestinian militants call Israel terrorist, Kurdish militants call Turkey terrorist, Tamil militants call Indonesian terrorist; and, of course, the nation-states call the militants who oppose their regimes “terrorists”. I personally believe that the emergence of Al-Qaeda was a result of Western countries meddling in Middle Eastern affairs; attacking civilians. The terrorist acts Al-Qaeda is committing is merely a counter attack. In a world full of wars and contentions, the only way to be heard and given attention is to act as violently as some government do. Even though this is not how it should be, but this is the approach of many terrorist organizations around the globe, especially Al-Qaeda. The amount of injustice and oppression some part of the world is facing from oppressive governments, make radical groups even more wanting to fight this oppression back. To conclude, it is important to notice that the notion terrorism might be problematic and is being exploited by certain developed nations against others. Social movement theory is a study within social science that generally explain why social movements or protests occur and what are their consequences. Understanding social movements and their impact on society through theories and models is vital. According to Goodwin and Jasper’s book, “The Social Movements Reader: Cases and Concepts”, Social movement is “A collective, organized, sustained, and no institutional challenge to authorities, power holders, or cultural beliefs and practices” (4). This generally means that any group of people that are trying to change or resist change in society form a social movement. Resource mobilization theory is a major theory in the study of social movements that emerged in the 1970s. It emphasizes the ability of movements to acquire resources and mobilize people to accomplish the movement’s goals. For social movements to sustain themselves over time, they need resources. John D. McCarthy and Mayer N. Zald, stated in their article that activists tend to work hard to mobilize more resources, to see their existing in new and imaginative ways, and to find ways to protest that are within their means (161). The means of mobilizing social movements can be through telephones, internet, lobbyists, etc. In addition, social movement organizations have a number of strategic tasks such as mobilizing supporters, neutralizing and or transforming mass, achieving change in targets (162). This theory argues that success or failure of social movements is primarily affected by political opportunities. It answers questions such as: Why does contentious politics seem to develop only in particular periods of history? Most social movement organizations tend to use the opportunities and constraints they face then collectively act to create new opportunities to achieve their goals. Sidney Tarrow, David Meyer and Doug McAdam are considered among the most prominent supporters of this theory. Framing process comprises a set of concepts and perspectives on how organizations, individuals, and societies perceive and communicate. The framing of such organizations either set by the organization itself or involved social construction. These social constructions include mass media sources, political or social movements, or other organization. According to “Comparative Perspective on Social Movements” article that was written by Doug McAdam, John D. McCarthy, Mayer N. Zald, framing process was referred to as “Conditioning the presence or absence of these perceptions is that complex of social psychological dynamics-collective attribution, social construction” (5). Framing involves the social construction of a social phenomenon by political or social movements. In order to analyze the development of AL-Qaeda, various scholars have pursued the application of social movement theory over the past ten years. This section will highlight the three major trends of social movements and their application to that of Al-Qaeda. The first theory is the Resource Mobilization theory. It is especially useful in describing the first decade of Al-Qaeda since its creation in 1988 whereas the previous decade has seen large elements of reaction to political opportunities and constraints as well as framing. There are many types of resources, moral, cultural, social organizational and material. In terms of organizational resource, the religious background of the movement was favorable. Al-Qaeda could ensure fast mobilization by arranging meetings at mosques which at the same time gave them legitimacy even in a repressive environment. Quintan Wiktorowicz mentioned in his article “Islamic Activism”, four mobilization methods that Islamic Activism was formed by. He explained that the role of the mosque is utilized as a religious mobilizing structure by various radical and non-radical Islamic groups. He quotes, “Within the physical structure of the mosque, Islamists offer sermons, lessons, and study groups to propagate the movement message, organize collective action, and recruit new joiners” (10). Since the emergence of AL-Qaeda, the organization has used mosques and religious gatherings to mobilize their ideologies and to attract Muslims to join. In this matter, mobilization through the mosque is analogous to the use of churches by civil rights movement in the United States. Al-Qaeda used mosques and after Friday gatherings to promote their extreme ideas and to get supporters. It was easy for Al-Qaeda, especially back in the 1990s, to attract Muslims from all over the world in the name of religion. The second theory is the Political Opportunity theory. Present day Al-Qaeda’s structure which has changed significantly from the past. Al-Qaeda’s structure has shifted from being a hierarchical organization in the 1990s to a decentralized structure in the recent years. At this stage, Al-Qaeda require less means of resource mobilization but more strategic action driven by external opportunities and constraints. Mohamedou Ould, in his article “The Rise and Fall of Al Qaeda: Lessons in Post-September 11 Transnational Terrorism”, argue that Al-Qaeda has visualizes this long term strategy of providing oversight instead of actual decision making to expand geographical outreach (71). Political opportunity, however, provides a more reasonable explanation in describing a movement that has adjusted to opportunities and constraints since it is unlikely that Al-Qaeda has anticipated a US invasion of Afghanistan and Iraq as a result of the 9/11 attack. In addition, opportunities for the growth of Al-Qaeda arouses as early as 1991 with US forces stationed in Saudi Arabia as a result of the intervention against Saddam Hussein’s Iraq. Al-Qaeda is capable of recognizing and benefiting from opportunities, but many governments were undermining that at that time. The withdrawal of allied forces from Afghanistan and Iraq may intrude on the one hand a new constraint for Al-Qaeda since it will no longer be easily possible to attack “the enemy”. On the other hand, it may present an opportunity for Al-Qaeda to establish an Islamic authority and achieve their goals. The political instability of neighboring countries like Mali, Niger and Southern Algeria may create a further opportunity in establishing more bases of Al-Qaeda in the region. This takes us to the third theory, which is the Framing Process. Al-Qaeda relies increasingly on framing to create a divide between Muslims and non-Muslims nourishing an environment of fear and increasing cohesion. Al-Qaeda’s claims constitute the political goals at the core of all framing. The first one is to end Israel’s occupation of Palestinian territories. The second one is to stop Western (especially US) support for authoritarian regimes. The third one is to rescue US military presence and hegemony in the Middle East and Central Asia. The last one is to end the “Inhumane capitalism guided by the war and oil lobby” (88). The uniqueness of these goals to Al-Qaeda is however controversial. Anti-Western narratives can be traced back to the Muslim Brotherhood’s Sayyid Qutb, of the most important figures of political Islam, who rejected the influence of the West. This framing claims justification for the killing of American civilians. Moreover, there are many organizations in the world that might share some of these goals, but it seems that these frames are only framed for Al-Qaeda. It was argued that Al-Qaeda shows strong signs of social movement and that social movement theory is especially applicable in describing the process of decentralization and reduction of hierarchy. Theories can thereby help analyze and understand the creation of conditions for mobilization (e.g. resource mobilization theory) as well as the ideological background. Social movement theory provides a useful framework for interpreting al-Qaeda. It help focus on the crucial questions of why and how the organization emerged and what caused the change in the organizational mode leading to today’s structure. The dominance of Western scholars in social movement theory and the perception that Islamism is somewhat exceptional led for a long time to the exclusion of generally non-Western movements and specifically Islamic movements. In conclusion, the transformation of Al-Qaeda has gone through different stages remarking a new structure of the organization. Since the emergence of Al-Qaeda in the 1990s, they have changed their goals and tactics depending on the opportunities and constraints around them. As a social movement, terrorism has played a big role in the international community, urging people to deeply trying to understand it and its consequences. This paper discussed the emergence of Al-Qaeda as a terrorist group in the 20th century as a result of hatred and resentment toward the Western interventions into the Middle East and Muslim countries. The discussion of social movement theory such as resource mobilization, political opportunity, and framing process, helped to better shape Al-Qaeda’s development. Resource mobilization in Al-Qaeda depended on attracting Muslims from all over the world who shared the same hatred and resentment toward the West using mosques and religion to promote their ideas. They used the war on Afghanistan against the Soviet Union as a start of their organization and then used every other occasion to attack. Al-Qaeda has also used the political and social opportunities to enlarge their terrorist attacks. The use of framing to set the goals and tactics of Al-Qaeda added a great deal in understanding the development of Al-Qaeda. In terms of Ideology, Islam was not necessarily what motivated such terrorist groups to come out and fight, but Al-Qaeda exploited the name of Islam and God to achieve their goals. Al-Qaeda has also used the political and social opportunities to enlarge their terrorist attacks (3,138). Are We Losing the New War on Terror, McLaughlin, John. Beyond al-Qaeda, RAND Corporation, 226 Pages, 2006. Print. Comparative Perspective on Social Movements: Political opportunities, Mobilizing Structures, and Cultural Framings by Doug McAdam and John D McCarthy, Mayer N. Zald. J Goodwin, JM Jasper, The Social Movements Reader: Cases and Concepts, John Wiley and Sons, Volume. 12 2009. Print. John D. McCarthy and Mayer N. Zald, The Social Movements Reader: Cases and Concepts,John Wiley and Sons, Volume. 12 2009. Print. Mohamedou, Mohammad-Mahmoud Ould. “The Rise and Fall of Al Qaeda: Lessons in Post- September 11 Transnational Terrorism.” Geneva Centre for Security Policy GenevaPapers – Research Series no 3. September 2011. Novemeber 15, 2012. Print. The strategic Logic of Suicide Terrorism, Roobert Pape. This entry was posted in غير مصنف on 3 February,2016 by sheesh.